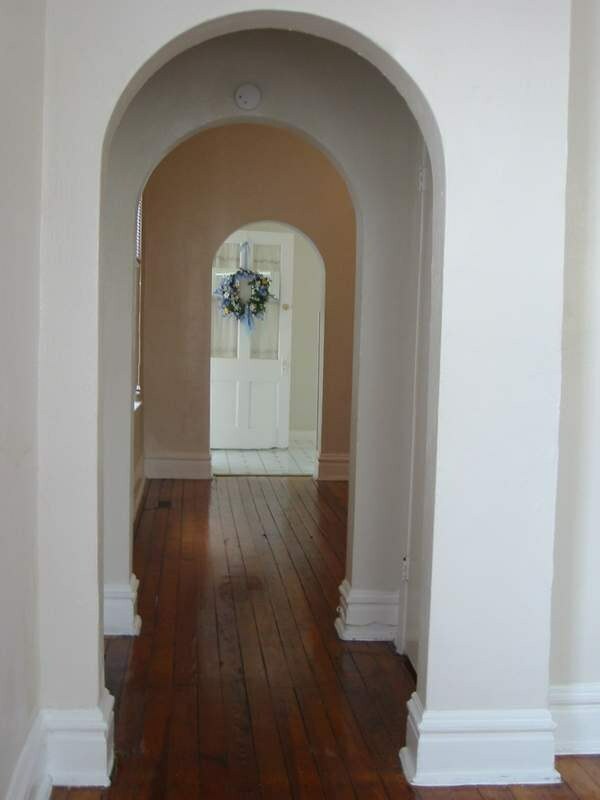 To make an arched doorway, first erecting a structure made of sheets of drywall, and then was decorated with her own hands. Arch can be a great option for the design of non-standard width aisles and replace a boring or awkward door. Its outer finish should blend harmoniously with the surrounding interior. Measure tape measure the width and height of the opening, where it will be located arched rounding. Put the correct size on a thick sheet of drywall. Cut a piece with a sharp knife. It's enough to make a shallow cut on the top layer of cardboard and break the sheet. You will need two of these blanks. Draw with a pencil onto the prepared workpiece centerline. Screw in the screw at the bottom of the axial. Take the twine, tie one end to the pencil, and the other clip on screwed into the screw. Will watertite the form of an arch. So the radius is smooth, the string must be taut. Saw out the detail in the pencil lines with a jigsaw. Make a second same item. Attach the guide profile in the doorway for a distance not less than 12 mm from the edge of the wall. Then attached drywall details will merge with the wall. Attach cut the arch to the design of the profile to the screws. Cap screws should be slightly recessed into the drywall to be patched. Measure the circumference of your arch. Put this size on the guide profile. To bend the profile along the arc, make notches with snips every 5 – 7 cm Screw in the prepared profile to the frame of the arch from the inside. Measure the distance between the guide inside the arch. Cut with scissors on metal crosspieces of the rack profile. Secure them inside the arch every 10 – 14 cm. Measure the circumference and width of the arch. Saw these dimensions of the workpiece from the restoration of the drywall. Swipe the back side restoration drywall with a roller with needles. Dampen a sponge perforated surface and cover with film. Leave on for a couple of hours. Wet the drywall to bend well. Attach the prepared strip inside the arch. Zashpaklyuyte cap screws with latex putty. The joints of the drywall route serpyanka and plaster. After complete drying of the structure grind all the irregularities of the fine-grained sandpaper. Now your arch can be painted or pokleit Wallpaper, whatever you like. Decorate the edges of the arch with mosaics. You can purchase ready-made mosaic, or you can do it yourself from the remnants of glazed tiles. Just smash it with a hammer into small pieces. Attach the mosaic to the wall or on the tile adhesive, or with glue "Liquid nails". The distance between the tiles complete the colored or white grout. The arch you can decorate real or artificial stone veneer, MDF.